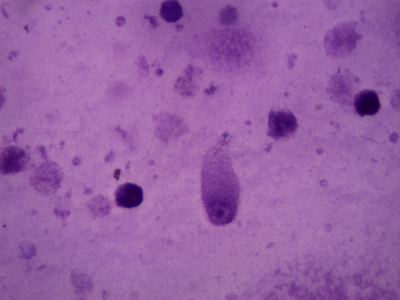 Isolated Amoebic Abscess of Spleen. IG Medical College, Shimla-171 001, Himachal Pradesh, India. Abstract: Amoebic liver abscess is the most common extraintestinal manifestation of amoebiasis. Extrahepatic amoebic abscesses have occasionally been described in the lung, brain, and skin and presumably result from hematogenous spread. Isolated amoebic abscess of spleen has been reported scarcely in literature. We report here a case of isolated amoebic abscess of spleen. Key Words: Entamoeba histolytica; Extraintestinal amoebiasis; Splenic abscess; Trophozoites. Each year about 50 million patients develop amoebic dysentery from Entamoeba histolytica infections; 40,000 to 110,000 die of the disease annually. amoebic liver abscess is the most common extraintestinal manifestation of amebiasis. Extrahepatic amoebic abscesses have occasionally been described in the lung, brain, and skin and presumably result from hematogenous spread. Occasionally involvement of the spleen has been reported. [3-5] We report here a case of isolated amoebic abscess of spleen. A 45 years old diabetic female was admitted with weakness of right half of the body for 6 hours. On examination, she was febrile; blood pressure was 170/100mm Hg and had right hemiplegia with global aphasia. Rest of clinical examination was unremarkable. Non-Contrast CT scan brain showed acute infarct in left middle cerebral artery territory with hemorrhagic transformation. Her hemoglobin was 9.4g%, total leukocyte count was 15910/mm3 with 85% neutrophils and ESR was 140mm. Blood biochemistry revealed random blood sugar-464mg%, urea-58mg/dl, creatinine-3.1mg/dl, sodium-138meq, potassium - 4.2meq, and chloride- 107meq. Liver function tests were normal. HbA1C was 12.9%, ELISA for HIV was non reactive. Urine examination was normal. 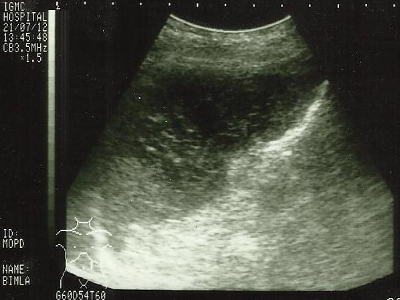 Her ultrasonography abdomen revealed a hypoechoic lesion of 5.3 x 4.7 cm with ragged margins in spleen (Figure 1) and possibility of splenic abscess was kept and about 90 ml of anchovy sauce like contents were drained under ultrasonic guidance. The wet mount preparation as well as Giemsa staining of drained material under oily immersion (figure 2) showed trophozoites of Entamoeba histolytica. She was treated with intravenous metronidazole, nursing care, statins and insulin. After five days her blood sugar was controlled and she became afebrile, however, treatment was continued for ten days. She was discharged on insulin, statins, aspirin, amlodipine and physiotherapy for hemiplegia. amoebic liver abscess is the most common extraintestinal manifestation of amebiasis. Complications of amoebic liver abscess may arise from rupture of the abscess with extension into the peritoneum, pleural cavity, or pericardium. Trophozoites are visualized in the abscess fluid in a minority of patients with amoebic liver abscess. In one series of 188 patients with extraintestinal amebiasis confirmed by means of clinical, surgical, and radiologic criteria over a 45-month period. Liver abscess was present in 183 patients (97%); five patients (3%) had other organ involvement but a normal liver. The majority of liver abscesses were in the right lobe. Ultrasonography was the mainstay of radiologic investigation. In another series of 16 patients of isolated splenic abscess only two had an amoebic abscess, four had fungal abscesses and ten had bacterial abscesses (including one case of tubercular abscess). Demonstration of trophozoites in the fluid is required for definitive diagnosis of amoebic splenic abscess as it is the least common cause of isolated splenic abscess. In this patient, isolated splenic abscess was found in a hypertensive, diabetic patient with recent thrombotic CVA and uncontrolled blood sugar. Aspiration of the abscess and subsequent treatment with metronidazole lead to the control of blood sugar and recovery of the patient. Stanley SL Jr. Amoebiasis. Lancet. 2003;361:1025�1034. Haque R, Huston CD, Hughes M, et al. Amebiasis. N Engl J Med. 2003; 348:1565-1573. Lawford R, Sorrell TC. amoebic abscess of the spleen complicated by metronidazole-induced neurotoxicity: case report. Clin Infect Dis. 1994;19:346�348. Mujahid S, Ahmed A, Siddiqui MN. Amoebic splenic abscess. Trop Doct. 1993;23:136�138. Misra SC, Kar P, Kulpati DD. Amoebic liver and splenic abscesses. Indian J Gastroenterol. 1989;8:204. Juimo AG, Gervez F, Angwafo FF. Extraintestinal amebiasis. Radiology. 1992 Jan;182(1):181-183. Ferraioli G, Brunetti E, Gulizia R, et al. Management of splenic abscess: report on 16 cases from a single center. International Journal of Infectious Diseases. 2009;13:524-530.